As the caravan of Hanover County softball fans made their way south down I-295 to Prince George, hopes were high. Hanoverians were guaranteed one team in the Central Region Softball Finals, and thus, the 2012 State Group AAA Tournament. Fans hoped two would make the championship round. In the first semifinal at Prince George High School, as expected, a pitcher's duel ensued between Patrick Henry senior Emma Mitchell and the hottest pitcher in the region the past two weeks, Atlee junior Jessica Holte. The Raiders came close to scoring off Mitchell in the first inning, getting runners to second and third before Shelby Hill popped out to Mitchell on the mound, ending the threat. The Patriots went in order in each of the first 3 innings, finally get a base runner in the fourth on an error by Blair Jones on an Allison Tingler grounder to second. She was stranded there. Atlee again put two aboard, this time in the fifth, but Cameron Hall grounded into a force out, then Taylor Sutherland grounded out to second to end the threat. Mackenzie Keyes led off the Atlee sixth with a single, then went to second on a Mattie Fitzgerald sacrifice bunt. But Mitchell struck out Hill, then induced Holte to fly out to left, and, again, a runner in scoring position was stranded. Patrick Henry had a tough time getting hits off Holte (she only allowed two), but the second proved to start the game-winning rally in the bottom of sixth, when Ellen Davidson shot one up the middle, and advanced to second on a sacrifice bunt by Paige Mitchell. After a Tingler walk, Sam Moore was hit by a pitch, which some observers believed hit the bottom of the bat rather than her arm/hand. After an umpire conference, she was awarded first base, loading the bases. Katie Woody stepped to the plate and hit a fly ball to mid-center field. Davidson tagged and scurried home, beating the Shelby Hill throw, and the Patriots were up 1-0. Madison Gilman lined out to short and the Patriots left two aboard. Atlee's last chance in the seventh went quickly, as Delani Farrar popped out to Moore at third, then Emma Mitchell struck out both Lexi Cumbia and Blair Jones to finish the victory. Mitchell finished with seven strikeouts, one walk, and allowed three hits, all singles. Jessica Holte was equally strong, striking out four, walking one, while giving up only two singles. 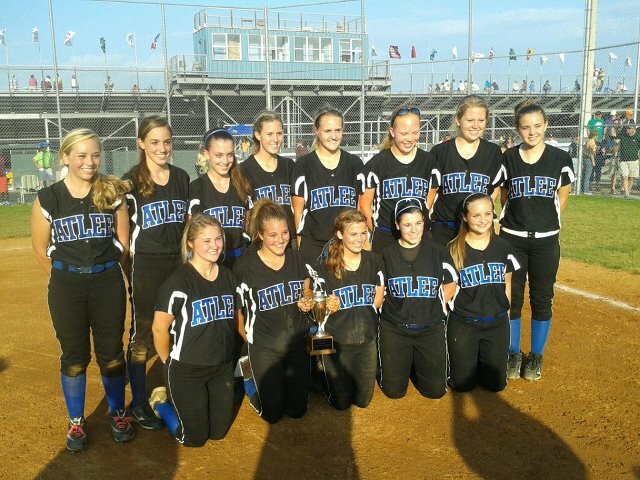 Atlee finishes 2012 with an 18-6 record and, while they will sorely miss Keyes and Cumbia as they graduate, they will return an impressive seven of nine starters in 2013, including Holte. Patrick Henry moves to 21-1 and will face Cosby in the Central Region Championship Friday at 5pm at Prince George High School. The game was moved up from a 7pm start due to the threat of severe weather in the region Friday evening. In the nightcap, the Confederate faithful sat on the first base side, replacing the Atlee faithful, hoping for a return to the state tournament won by Lee-Davis one year previous. Both teams went scoreless through the first four innings, though each time had a runner on base in each 1/2 inning except the Cosby 4th. Lee-Davis left one runner on base in each of the first three innings, and two in scoring position in the fourth, when Ryleigh Hawker doubled, then Amy Wingfield singled. Kinsee Stonebreaker, pinch running for Wingfield, stole second, but Taylor Deemer flied out to center and Ashley Berry struck out to end the Confederates' threat. Lee-Davis again put runners at 2nd and 3rd, this time with nobody out in the fifth. Cosby starter Chelsea Whitcomb then struck out Lacie Madison, got Casey Price to line out to third on a hard hit ball, and Haleigh Cottrell to line out to right to, again, end the threat. Cosby would strike first, in the bottom of the fifth, when Lee-Davis ace Lauren McIntyre walked Sam Quinn with one out, bringing up lead-off hitter Meagan Jones, who had already singled twice. She roped a shot over the head of Price in center field for triple, and Quinn scored. Next, a suicide squeeze attempt by Ellen Sweat worked as the toss from McIntyre to Cottrell at the plate was mishandled, and Jones scored to make it 2-0. The Confederates, though, bounced back in the top of the 6th, as Wingfield doubled to center with one out. Taylor Deemer singled to right, and the throw from Cosby's Karie Burgess went to the back stop, allowing Wingfield to slide head first home for the run. Deemer smartly advanced to third during the brief chaos behind the plate, but was stranded there when Berry's bunt attempt failed and Becca Fields grounded out. Cosby picked up an insurance run in the bottom of the sixth. With two outs, Burgess walked, then Bridgett Blakeley roped a double to left-center, scoring Burgess for the 3-1 lead. The Confederates went down in order in the 7th, and although they out hit the Titans 9-6, the runs on the scoreboard mattered the most. McIntyre threw 71 pitches over six innings, striking out one, while walking two. Unfortunately for Lee-Davis fans, both of those walks turned into runs. The Confederates fall a game short of returning to the State Tournament, finishing the season 19-5. Head Coach Jackie Davis, clearly emotional after the game, noted the monumental contributions of this senior class while acknowledging a good nucleus returning for 2013. Though they fell a game short of returning to the state stage, the Lee-Davis softball class of 2012 can always hold their heads high, knowing they were part of making history in 2011, and, overcoming many obstacles to again make noise in 2012. Both Hanover and Atlee entered their Central Region Girls Soccer Semifinals decided underdogs. By night's end, the scoreboard reflected why. Hanover's run in the 2012 post-season ended when Deep Run, getting to play on their home field hosting the Regionals, thumped the Hawks 11-0 to advance to the regional final and the State Group AAA Tournament. Atlee suffered its first and only loss of 2012 Thursday night in the nightcap when they were shut out by Cosby, 5-0. Though their seasons didn't end the way they hoped, our heartiest congratulations to both the Hawks and Raiders on excellent seasons! FOLLOW US ON TWITTER FOR LIVE SCORE UPDATES FROM SOFTBALL GAMES! 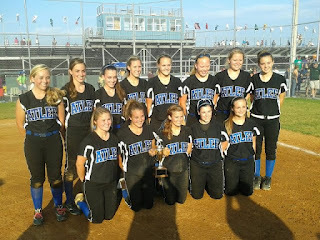 Congrats to Atlee Softball--Capital District Tournament Champions! The quarterfinals in Central Region Tournaments in all spring sports are now done. Let's review! BASEBALL: The season came to an end in Hanover County Monday when both Atlee and Hanover fell in quarterfinal action at Randolph-Macon College. Atlee was held to only two hits by Dinwiddie pitcher Michael Bridgeman as the Generals defeated the Raiders 4-0. Later in the day, Matoaca and Hanover battled back and forth until Matoaca's Michael Birdsong blasted a two-run homer for the winning margin as the Warriors eliminated the Hawks, 5-3. SOFTBALL: The county's fortunes in softball are totally the opposite, as all three teams that reached Central Region play advanced to the semifinals. Patrick Henry eliminated Manchester 5-0 Tuesday evening in Ashland, while Atlee traveled to Dinwiddie and defeated the Generals 4-1. Lee-Davis, in a rematch with Prince George, easily handled the Royals 10-1. Patrick Henry and Atlee will play in one Region semifinal on Thursday at 5pm at Prince George High School, while Lee-Davis will face Cosby in the other semifinal at approximately 7pm. BOYS SOCCER: Both Hanover and Atlee were eliminated in quarterfinal action Tuesday night. Hanover was shut out on the road at Thomas Dale, 3-0, while Atlee hosted Matoaca in a back-and-forth matchup which saw the Warriors take the lead for good in the 66th minute and cling to a 3-2 winning margin. GIRLS SOCCER: Hanover upset Thomas Dale on its home turf Tuesday afternoon to advance to the Region semis. Shelby Hooe had both Hawk goals in regulation and the game-winning kick during the penalty kick phase after overtime to seal the win. Meanwhile, unbeaten Atlee breezed past Prince George 9-0. Atlee will face Cosby, who only has one tie on the season (and no defeats as well) in Thursday's second semifinal at Deep Run High School. Hanover draws the home team, Deep Run, in the first match at 5:30pm. Atlee came into both the Capital District softball and baseball semifinals this evening as the #3 seed. By night's end, the winning number combination for Raider fans would be "5-2". In softball, Shelby Hill had three hits and scored two runs, while Jessica Holte scattered six hits and struck out three as Atlee defeated Hanover 5-2 to clinch a Central Region Tournament berth and set up a rematch against #1 Lee-Davis in Friday's tournament final. Hanover scored first on Brooke Throckmorton's RBI single which plated Erica Barrett making it 1-0 Hawks. Atlee left runners on base in each of the first three innings, but in the third were able to tie the game when Delani Farrar's hard grounder to pitcher Kiandra Mitchum was tough enough to handle to give Cameron Hall time to score from third. In the fourth, the Raiders took the lead for good as Hall's RBI single scored Hill. The Hawks stranded a runner at third in their half of the inning. Atlee broke the game open in the fifth. A one-out single by Mattie Fitzgerald was followed one out later by Hill's third hit of the game, a single. Lexi Cumbia then singled, scoring Fitzgerald. During the next at-bat by Blair Jones, two passed balls allowed both Hill, then Cumbia to score, extending the lead to 5-1. The Hawks mounted a brief rally in the 7th, scoring one, but the threat ended when Mitchum grounded out to shortstop Taylor Sutherland, and smiles broke out in the first base dugout. Atlee is now 16-5 on the season (they finished 9-3 in the Capital) and will play Lee-Davis Friday at 5pm for the Capital District Tournament title. The Raiders baseball squad waited out an hour plus rain delay, then battled evenly with Lee-Davis, requiring an extra inning to gain the upset win. Two walks by Michael Thomas helped the Raiders score a run in the top of the first. Thomas' home run a few innings later tied the game at one. Atlee would score another run, then Lee-Davis plated a run in the bottom of the sixth to tie the game again. Atlee stranded a runner at third in their half of the seventh, while the Confederates left two on base in their half. The Raiders would strike in the eighth. Mike Harmon's RBI single drove in Andrew Starke. Chop Pulisic later singled to score Harmon, then Dalton Ruch drove in the final run of the inning with a single. Lee-Davis got a one-out double by Thomas in the bottom of the eighth, but Luke Bolka got Josh Lam to fly out to center, then struck out Jesse Smith to end the game. In soccer action, the Hanover boys won the Capital District crown with a convincing 6-1 victory over Atlee. The Hawks' girls team easily handled Henrico 7-1 in the second girls semifinal, setting up a championship match against Atlee Friday at 5pm. ---The softball, baseball and girls soccer finals are ALL at Hanover High School on Friday at the above times. ---Patrick Henry's Colonial District Softball Final against Deep Run was postponed due to rain, now set to be played Friday at 7pm. ---In addition to the Dinwiddie/Atlee matchup, the other Central Region Baseball Quarterfinals, to be played at approximately 11am, 1pm and 3pm Monday, are Deep Run/Cosby, Hanover/Matoaca, and James River/Hermitage. The games were supposed to start at 5pm. At 4:25, athletes were ordered inside Hanover High School when thunder and lightning arrived. Two and one half hours later, the skies finally began to clear. Though the softball field took the brunt of Mother Nature's wrath, some quick work with the tarp on the baseball diamond allowed officials to at least get one semifinal in tonight at the Capital District Jubilee. The 5pm game began around 8:20, with the top-seeded Hanover Hawks falling behind early to Glen Allen 1-0 before tying the game in the third and taking the lead for good in the fifth en route to a 3-1 victory and a berth in Friday's District Championship game. The Hawks will play the winner of the other semifinal between #2 Lee-Davis and #3 Atlee which is now scheduled to be played Thursday at 5pm. Both District softball semifinals were cancelled, with visible ponds of water in the outfield due to the week's persistent rain activity. Officials have rescheduled the games for tomorrow, when #1 Lee-Davis will face #4 Glen Allen at 3pm, and #2 Hanover will battle #3 Atlee at 5pm. One girls soccer semifinal was played tonight as the scheduled 5pm game between Atlee and Glen Allen began around 7:45. The Raiders led 2-0 at halftime, then scored in droves late in the game for an 8-0 victory. The other semifinal will take place Thursday at 5pm. Meanwhile, at Lee-Davis, where weather was less of an issue, both boys soccer semifinals were eventually played, with Atlee and Hanover winning their games to set up a fourth meeting between the teams for the District title Thursday, 5pm, at Lee-Davis. The game was originally set to be played at Hanover, but, in an effort to ensure games are played Thursday, as more storms are in the forecast, organizers opted to continue to use the second venue to complete the boys soccer tournament. Lee-Davis' Angela Sportelli's hopes for a Central Region tennis title ended Tuesday when she fell to defending champion Christine Abbott of Midlothian, 6-3, 6-0. Abbott goes on to face Deep Run's Caroline Mosberg in the finals, scheduled for noon Wednesday at Manchester High School. Ashley Samuels' single in the second inning scored pinch-runner Beth Ford, and Emma Mitchell and the Patrick Henry defense made it stand as the Patriots advanced to the Colonial District Softball Tournament Finals Tuesday afternoon with a 1-0 victory over Mills Godwin. The Eagles loaded the bases in the third inning but could not score and left two stranded in the fifth inning. Mitchell struck out two of the three batters in the seventh to shut down Godwin for good. The Patriots advance to play Deep Run, 1-0 winners over J.R. Tucker in the other semifinal, in the tournament championship game Thursday at 7pm, weather permitting, at Mills Godwin. The Capital District "Jubilee" at Hanover High was postponed 24 hours due to weather conditions after an early afternoon thunderstorm dumped heavy rain on the campus. The baseball, softball, and soccer games are rescheduled for Wednesday at 5pm. J.R. Tucker's Micah Gorman struck out twelve and scattered three hits as the Tigers defeated Patrick Henry 3-0 Monday night in the quarterfinals of the Colonial District Baseball Tournament. Kyle Palmer went the distance for the Patriots, who finish the 2012 season at 11-10. Tucker advances to play top-seeded Deep Run Tuesday afternoon in the semifinals at Mills Godwin. The other semi will pit #2 Douglas Freeman against #6 Hermitage, who upset #3 Mills Godwin Monday night, 2-1. In Colonial District soccer, the Patrick Henry boys fell short in their quarterfinal match, losing to Douglas Freeman 3-1, finishing their season with a record of 7-8-1. Meanwhile, the girls team went into a second sudden death before falling to Maggie Walker Governors School, 1-0. Freshman goalkeeper Berkley Hall had 14 saves for the Patriots, who also finished 2012 with a 7-8-1 record. Capital District Baseball and Softball Semifinals are set to begin at 5pm Tuesday at Hanover High School. A hard fought Capital District and Hanover County rivalry game had gone according to script after six innings. Both Lee-Davis and Atlee battled against top pitchers, had some opportunities to score, and, in the end, both had plated a run apiece. The seventh inning was a rollercoaster ride. With one out, Cameron Hall blooped a single into right field for the Raiders. Taylor Sutherland's sacrifice bunt moved Hall to second, and MacKenzie Keyes stepped up and laced a single to left, scoring Hall, and, suddenly, the Raiders led 2-1 on the road, three outs away from tying the Confederates for the District title. The Confederates, defending state champs, entered their half of the seventh confident they could do what was necessary to extend, or win, the game. Pinch hitter Victoria Houff led off with a walk. A Becca Fields bunt attempt was fielded by Atlee starter Jessica Holte, who threw to second for the force out. Then things went terribly wrong for the Raiders. Kelly Heinz grounded to second, but Blair Jones' throw to second for the force was low, went underneath the glove of Sutherland, the shortstop, and landed in center field. The throw back into the infield got away from the Raiders. Fields moved to third and Heinz to second. Kinsee Stonebreaker pinch ran for Heinz. Lacie Madison was the next batter. She lined a single to right field that went off the leg of Jones, giving Fields time to score the tying run and Stonebreaker time to score the District-winning run. Atlee finished the regular season at 9-3 in the Capital District, 15-5 overall and win face Hanover Tuesday in the Capital District Tournament semifinals. Lee-Davis finished 11-1 in the Capital, 17-3 overall and will battle Glen Allen in Tuesday's other semifinal. Congratulations to the Patrick Henry softball team, who captured the Colonial District title Thursday with a victory of J.R. Tucker, completing an undefeated District season. They go into next week's District Tournament as the top seed, with only one loss on the season. Meanwhile, J.R. Tucker handed Patrick Henry an 8-2 loss at home in their baseball finale. The Atlee Boys and Girls Outdoor Track Teams swept the Capital District Tournament titles Thursday night at Glen Allen High School. The Capital and Colonial District Track Tournaments began Wednesday afternoon at Glen Allen High School and continue through Thursday night. Follow us on Twitter (@hanoversports) for updates this evening and during tomorrow night's finals! In spite of the weather, some scheduled action took place Tuesday as the race for District titles come down to the wire! Lee-Davis 2, Glen Allen 0 (Kelly Heinz hit a home run in the top of the 7th to end a scoreless tie while Lauren McIntyre struck out ten. NOTE: If Atlee wins tonight in their makeup game against the Springers and defeats Lee-Davis Friday in the season finale, they will tie for first in the Capital District. If Hanover defeats Henrico, there will be a three-way tie. If Lee-Davis wins, they win the District outright. Alex Sandborne drove in the winning run in the bottom of the seventh to give Midlothian a 2-1 upset win over Hanover, ending the Hawks softball winning streak at seven games. Kiandra Mitchum pitched a complete game for the Hawks, who are now 11-6, and welcome Varina Tuesday for Senior Night. Atlee's offense woke up from a slumber, striking for eight runs in the sixth inning to break open a surprisingly close game to defeat Henrico 11-1 in six innings. Cameron Hall had three hits and three RBI, while Shelby Hill doubled and tripled, scored once and drove in two runs. The Raiders move to 8-2 in the Capital District, 14-4 overall, and travel to Highland Springs Tuesday night. In baseball, Atlee scored in every inning to dispatch Henrico by the same 11-1 count and look to solidify the number three seed in next week's District Tournament Tuesday at Highland Springs. Sportelli Wins Capital District Title! Congratulations to Angelina Sportelli of Lee-Davis for winning the Capital District Girls Tennis Tournament singles crown Friday with a 6-2, 6-4 win over Ashley Milo of Varina. Sportelli was also named District Player of the Year, while Hanover's head coach, Kim Weis, was named District Coach of The Year. Our congratulations to both ladies!! To go to our page, just click on the picture of Hanover Courthouse on the right-hand side of the page! Huge Night of Friday Action! --Chris Childress pitched a three-hit shutout leading the homestanding Hanover Hawks to a 2-0 win over Lee-Davis and sole possession of first place in the Capital District Friday night. Hanover is now 9-1 in the Capital, 15-3 overall, while Lee-Davis fell to 8-2 in the Capital, 13-5 overall. The Hawks scored both of their runs in the fifth inning. --Atlee was upset by Glen Allen Friday night, 10-7, another big District road win for the first-year Jaguar varsity program (they won at Hanover early in the season). Glen Allen led 2-1 after five innings, then the fireworks began. Glen Allen scored one in the sixth to take a two-run lead, but Atlee struck for four runs in the bottom of the frame to take the lead for the first time, 5-3. But the Jaguars exploded for six runs in the seventh inning to take a 10-5 lead. Atlee could only muster two runs to close out the scoring. The Raiders are now 6-4 in the Capital, 10-7 overall, fighting to stay in third place in the Capital, which is important when it comes to seeding in the upcoming District Jubilee Tournament. --Hanover's winning streak reaches seven with a convincing 6-0 win at home over Lee-Davis, handing the Confederates their first loss in the Capital District in 2012. Erica Barrett made a key defensive play to help keep Lee-Davis off the scoreboard in the top of the fourth, when the C-Feds ended up leaving the bases loaded. In the bottom of the fourth, Hanover put together five runs on five hits, and aided by two critical Lee-Davis errors that allowed the first two runs to score, extending the inning. Kiandra Mitchum scattered just three hits over seven innings. The Hawks are now 8-2 in the Capital District, 11-5 overall. Lee-Davis is still in first place in the Capital at 9-1, 15-3 overall. Hanover finishes their regular season next week at Midlothian on Monday, and District games at home Tuesday against Varina and Friday at Henrico. Lee-Davis has a tougher road ahead, traveling to Glen Allen Tuesday night, then hosting Atlee Friday night. Lee-Davis remains in control of their destiny, but a loss next week could open a door for Hanover or Atlee. --Meanwhile, in the Colonial, Emma Mitchell scattered four hits for another complete game victory as Patrick Henry stayed unbeaten in the district with a 8-1 victory at Mills Godwin. Katie Woody homered for the Patriots, going 3-for-4, while Sam Moore and Madison Gilman had two hits each. The Patriots are 13-0 in the Colonial, have long clinched the regular season crown, and 16-1 overall. They finish the season Monday in a makeup game against another Top 5 Region team at home against Dinwiddie, then welcome J.R. Tucker to Ashland Thursday for Senior Night. --Atlee ended their two-game slide with a critical road win over Glen Allen, 4-1 on Friday. Jessica Holte pitched a no-hitter, striking out ten Jaguar batters. All of Atlee's runs came in the fourth inning, as the Raiders move to 7-2 in the Capital, 13-4 overall. The Raiders finish the regular season beginning Monday with a makeup game against Henrico at home at 7pm, then travel to Highland Springs on Tuesday and Lee-Davis for the finale on Friday. --Hanover and Lee-Davis made it through their boys game at Hanover tonight with no incidents, just good play. Hanover defeated Lee-Davis 3-1 with two second-half goals by Josh Hadley-Goggin. The first goal was via a header from a free kick into the offensive zone, while the second was off a rebound when Travis Borkey shot the ball, it was saved in the air by Lee-Davis goalkeeper Drew Shelton, but he couldn't control it. It landed in front of Goggin, who knocked it in for the insurance goal. Hanover is now 8-1 in the Capital, 10-3 overall. Lee-Davis fell to 6-3 in the Capital, 7-5 overall. The first game between these two teams in April in Mechanicsville was suspended in the first half after an altercation between players from both teams. --Connor Hulser was one of four Atlee Raiders to score goals en route to a 4-0 victory over Glen Allen. Atlee stays 1/2 game ahead in the District standings at 9-1, 9-1-1 overall. In Girls play, Hanover scored six unanswered goals in the first half en route to an easy 8-0 win over Lee-Davis, improving their record to 8-2 in the Capital, 10-3 overall. The Confederates fall to 5-5 in the Capital, 5-9 overall. Atlee's girls team cruised to another win, this time 6-0 over Glen Allen to stay unbeaten, 10-0 in the Capital District, 14-0 overall. Danny Polk of Hanover advanced to Friday's final against Henrico's Shyam Venkatasubramanian with a victory over Atlee's Thomas Rischcoff, 7-6, 6-2. The Hanover doubles team of Polk and Logan Healey will also play in the finals. Angela Sportelli of Lee-Davis advanced to the girls' singles final with a 6-4, 6-1 win over Henrico's Ally Phillips. She will battle Ashley Milo of Varina for the championship Friday. Hanover's doubles team of Hannah Tibbett and Mallory Moore fell in the semifinal round. Events scheduled for today were wiped out due to the large round of rain that arrived Wednesday afternoon. The softball game featuring two of the Central Region's top teams, Patrick Henry and Dinwiddie, has been rescheduled for this Monday, May 14th, time TBD. The Atlee track team was entered into a six-team meet to be held today at Glen Allen High, but it was called off. No word yet on if or when this meet would be rescheduled. Both Patrick Henry boys doubles' teams lost in opening round action. In girls play, both doubles teams advanced in the first round, but fell in the quarterfinals. Angelina Sportelli of Lee-Davis is the lone county qualifier for the District Tournament Girls Semifinals. Karen Pak of Glen Allen knocked out Hanover's top seed, Hannah Tibbett, 6-0, 6-1. Freshman Carly Feyerabend of Atlee won her first round match, but fell 6-2, 6-0 in the quarterfinals to Henrico's Ally Phillips. Big Night For Hanover Hawks! The irony of a hawk perching at various locations around the Hanover High School athletic complex Tuesday night, observing action below, is not lost. By night's end, the Hawks softball team had won their sixth straight game, the baseball team drew closer to a District title showdown with Lee-Davis, and the Boys Soccer team knocked Atlee off their unbeaten perch. --Erica Barrett slammed a home run to extend an early 3-1 Hanover lead, helping the Hawks to victory. Kiandra Mitchum gave up twelve Raider hits, but Atlee left 11 runners on base. The Raiders outhit the Hawks 12-8, but leaving runners stranded doomed their chances of sweeping the season series from Hanover. The Hawks move to 7-2 in the Capital District, 10-5 overall, while Atlee falls to 6-2, 12-3. The Hanover victory gives Lee-Davis, unbeaten in the District, a two-game lead in the standings, with the Confederates coming to Hanover Friday at 6pm. Atlee looks to rebound Friday at home at 7pm against Glen Allen. --The Hawks only allowed six hits to the Raiders, who left the bases loaded in their half of the fourth inning. The Hawks now await Lee-Davis, winners Tuesday over Highland Springs, for a matchup Friday at 7pm. --After losing to Atlee on the road April 5th in the final minutes 1-0, Hanover exacted revenge, taking a 2-0 lead en route to a 2-1 victory, Atlee's first loss of the season. Jordan Cleveland scored in the first half for the Hawks, Cole Snyder in the second. Atlee falls to 8-1 in the Capital, 8-1-1 overall, while Hanover goes to 7-1 in the Capital, 9-3 overall. It was a profitable trip from Chesterfield County to Atlee High School Monday night. In games postponed from April 25th, the Cosby baseball squad jumped on the Raiders early, scoring six runs in the first en route to a 12-2, five inning win over Atlee. The size of the loss was surprising, as Atlee fell to 10-5 overall. They are 5-2 in the Capital District as they attempt to stay within striking distance of the District regular season title. On the next field over, the Raiders softball team shut out Cosby for six innings, but couldn't keep them off the board in the final frame. Chelsea Whitcomb hit a Grand Slam home run in the top of the seventh to lead Cosby to a 4-1 win over the Raiders. Whitcomb was the Titans' starting pitcher, giving up one run on three hits over four innings. Kirsten Copley came in relief of Whitcomb in the fifth and retired the Raiders in order in three consecutive innings to set the stage for the Cosby comeback. Jessica Holte took the loss, striking out six and walking one, giving up three earned runs and six hits. The Raiders are now 12-3 on the season, still 6-1 in the Capital District as they prepare for a showdown tomorrow night at Hanover, winners of five straight including handing Patrick Henry their first loss of the season last Wednesday night. After losing their first game of the season to Hanover Wednesday, Patrick Henry returned to Colonial District play Friday at Douglas Freeman and wasted no time getting back on track. The Patriots scored nine runs in the first inning en route to a 16-0, 5-inning win over the Rebels. Emma Mitchell struck out ten while her battery-mate, catcher Madison Gilman, went 4-for-4. Patrick Henry, now 11-0 in the Colonial, 14-1 overall, step out of District again Monday with a trip to Hopewell. Then, Wednesday night, Dinwiddie, one of the top five teams in the Central Region, comes to Ashland for a possible playoff preview. Meanwhile, the Patriots' baseball team's woes continue, falling short at Douglas Freeman 4-3. Patrick Henry scored all three of their runs in the fifth inning. The Rebels scored one in the sixth, then plated three in the bottom of the seventh for the comeback win. The heartbreaking loss puts the Patriots at 7-5 in the Colonial, 9-7 overall. Girls player of the week: Brooke Throckmorton of Hanover! Congratulations, Brooke! Details and video comments from Throckmorton available by clicking the title link. Kiandra Mitchum is a warrior. Her gutsy 152-pitch performance Wednesday night, combined with the timely hitting and defense of Brooke Throckmorton, led Hanover to a 3-2 upset victory at home over previously unbeaten Patrick Henry. "Our team did a fantastic job in execution tonight," said Hanover Head Coach Brian LeTourneau. "It's tough to get swings and misses on (Patrick Henry). Kiandra kept her composure, kept the ball down in the zone, and was as cool as the other side of the pillow." She had to be. Patrick Henry never went down in order in any inning, leaving 13 runners on base, including the bases loaded in the first after taking an early 1-0 lead. Paige Mitchell began the game with a bloop single, stole second two batters later, went to third on a single by Katie Woody, and scored when Madison Gilman laced a single to left. Hanover answered in the bottom of the frame, with Erica Barrett leading off with a single to center, advancing to second on the first of three sacrifice bunts on the night by Mitchum, then scoring on Brooke Throckmorton's seeing eye single into left field to tie the game. Mitchum, who threw 69 pitches in a five-inning win over Highland Springs Tuesday night, threw 51 pitches in the first two innings alone Wednesday night, 74 in the first three. The Patriots constantly put runners on base, but for four straight innings, she and the Hawks defense kept the Patriots from crossing the plate. Hanover finished their scoring in the third with two runs. A key play was a lead-off walk to Barrett by Patriots ace Emma Mitchell. Barrett fell behind in the count 0-2, battled through the at-bat, and drew the walk. Mitchum again sacrificed Barrett to second on a bunt, then Throckmorton struck again, hitting a double to the gap in right-center to score Barrett. Throckmorton would later score when Maura Long's fly ball to deep right went into, then out of the glove of Patrick Henry's Allison Tingler. The Patriots left two on base in the fourth and fifth, then cut the Hawks lead in half in the sixth. Ellen Davidson led off with a single to right, then scored three batters later when Tingler blasted a triple to right field. But the Patriots stranded Tingler, the tying run, at third. In the seventh, Madison Gilman led off with a ground ball that bounced off Lynsee Caler's glove at third base into the glove of shortstop Shauna Kirby, whose throw to first base beat Gilman by a half-step. Mitchum then fell behind, giving back-to-back walks to Ashley Samuels and pinch-hitter Hunter Glave. Davidson grounded out to Mitchum, advancing the runners to second and third. Kendall Thomas stepped to the plate. The Patriots center fielder already had two hits on the night, but Mitchum dug deep, and, on her 152nd pitch of the game, got Thomas to swing and miss for the strikeout, and the celebration began on the third base side of the field. Adding to the emotions of the night was the return to the dugout of star pitcher/slugger Shannon Albright, out for the season after injuries suffered in an automobile accident near the end of spring break. Teammates spoke of the spark her presence in uniform gave to the team during the game. "We have more confidence," said Throckmorton after the game. "But we need to beat Lee-Davis and Atlee." Both Capital District rivals come to Hanover in the next nine days. The Hawks lost to Atlee 4-3 and to Lee-Davis 8-0 earlier this season. Patrick Henry, still unbeaten in the Colonial District at 10-0, travel to Douglas Freeman Friday night. They are now 13-1 overall. Hanover, now 9-5 overall, has won five straight since the Lee-Davis defeat back on April 17th. It was a VERY busy day in high school sports! Big Night All Around For Hanover Hawks! They couldn't have asked for a better homestand this evening! In baseball, Hanover scored early and Chris Childress shut out Highland Springs, 3-0. In softball, the Lady Hawks scored five in the first inning and never looked back, winning over the Springers 11-1 in five innings. On the soccer field, Hanover pitched a shutout, defeating Highland Springs 3-0. Word from the road tells us Hanover pulled out a 5-4 victory in Boys Tennis this evening over Henrico. And Hanover clinched the Capital District regular season Girls Tennis title with a 7-2 victory tonight over Henrico. The baseball and softball games between Patrick Henry and John Marshall scheduled for 4:30 today at John Marshall have been postponed until Thursday May 10th.